The streets of London in the seventeenth century were filled with sounds––a cacophony of animal and human noises. Music was ubiquitous, flowing from churches and alehouses, from theaters and barber shops, from court dances and country dances, and into the streets where it mingled with the martial drums, fifes and bugles of soldiers, the chanteys and hornpipes of sailors, the cries of fish mongers and fruit sellers, and the singing of weavers, coopers, cobblers and many other tradesmen and women. At the center of this aural environment, as we have seen, was the broadside ballad peddler, a combination of street performer and town crier, who sang the latest ballads on street corners and attracted crowds seeking news and entertainment. The ballads were purchased and brought into homes and businesses throughout the city, where they were performed again and again, until the next popular broadside hit the streets. The broadside ballad survives today primarily in its written form. But while the printed texts of the ballads are easily accessible to scholars, the ballad music has been more difficult to find. Those who overlook the musical dimension of balladry, however, are missing a large part of the story. The American folklorist Philips Barry writes, “Music and text form an organic whole. The tune is ‘the life of the ballad’––so much so, that no ballad can survive, if it cease to be sung.”1 Although the last part of this statement may be a bit extreme, the main point is important. Music provides the ballads with a performative context, which literally brings the ballad to life. In the act of singing, the ballad is lifted from the printed page and is embodied by the singer, who through his or her breath sends the song into the air where everyone within hearing range can experience it. Like the ballads’ texts and their measure, as described in previous essays, the music of balladry was taken from a wide range of sources, and in turn influenced many other cultural products. It is therefore difficult indeed to make definitive statements about what constitutes “ballad music.” One thing that is certain is that the tunes used for the ballads were primarily melodies that were well known to British audiences. Broadside ballad writers assumed that their consumers possessed an oral repertoire of popular melodies, so they did not need to include musical notation, but rather simply stated the name of a popular tune on the broadsheet. Even if a tune title was unfamiliar to the customer, the ballad peddler would sing the melody repeatedly until it was memorized. Many different ballads were sung to the same tune, and often the tune name would be changed to refer to the most recent hit. For example, “A Lamentable Ballad of the Ladies Fall” (Pepys 1.510-511) was to be sung to the tune of “In Peascod Time.” This proved to be such a popular broadside that, from then on the tune “In Peascod Time” was known as “The Lady’s Fall.” Other tunes had three, four, or more different names. 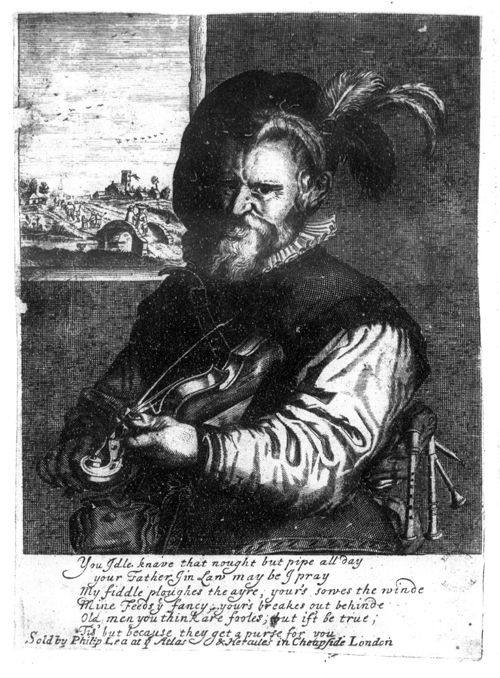 By the seventeenth century some of the ballad tunes were already quite old, coming from folk traditions, or emerging from earlier forms of balladry. A few of these older melodies, like “Chevy Chase,” “Fortune My Foe,” or “Greensleeves,” were popular for over a century. These old tunes were not only adapted for many different ballads; they also served as the basis for hymns and dance arrangements. Individual performers introduced their own unique variants of the melodies in a range of contexts, resulting in a great degree of variation in the melody. The interpretation of melodies is a dynamic process, especially when they are orally transmitted, but it is a conservative process as well. We are fortunate that so many melodies can still be heard today, essentially the same as they were four hundred years ago. There was a strong connection between balladry and dancing––the word “ballad” comes from the Latin “ballare” (“to dance”), the same root as “ballet.” The use of dance music for ballad singing was controversial, as some of the more puritanical Protestants considered dancing to be immoral. Nevertheless, many of the ballad melodies were also popular as tunes for “country dancing,” and there is evidence that, in the absence of instrumentalists, a single ballad singer could accompany dancers. These dance tunes were published in small books like John Playford’s The English Dancing Master. In its eighteen editions, from 1651 to 1728, Playford published the most popular airs of the day. Another important collector of ballad tunes was Thomas D’Urfey, a multi-talented man who wrote plays, songs, poetry, and comedy. He was a musical composer as well, but spent much of his effort adapting and arranging already extant tunes. He published his arrangements in Wit and Mirth, or Pills to Purge Melancholy (1698-1720), a compilation of many of the seventeenth century’s most popular melodies. It is from printed sources such as these that we can find the music for such popular ballad tunes as “Up Tails All,” “Drive Cold Winter Away,” “Broom, the Bonny Broom,” and dozens more. Dance tunes were usually short, repetitive and rhythmic, fitting the stanzaic form of the ballads. Many consist of just two melodic phrases––an “A” part, sometimes only four bars long, followed by a “B” part, usually of equal length.2 These A and B parts could be repeated as necessary to fit varying stanza lengths. For example, one ballad might require a musical pattern of AB AB AB AB, but another ballad might require the same tune to be performed with an AAB pattern, ABB or AABB. The melodic simplicity of these dance tunes made them easily adaptable to many different ballad texts. Just as today’s popular music consists of both dance music and more narrative “ballads,” the popular music culture of seventeenth-century England was characterized by a dynamic relationship between styles and genres. Many dance tunes became popular ballad tunes, and in turn, popular ballad tunes were often arranged for new dances. Also, a two-way relationship existed between the street and the stage. In the early seventeenth century, theatrical performances were often concluded with a “jigg” or jig, a humorous dialogue between a man and a woman sung and danced to one or more popular ballad tune. The most popular of these jigs, such as “Frauncis’ New Jigg” (1.226-227), were published as broadsides. By the second half of the seventeenth century, many ballad tunes were originating in the theater, created by such popular composers as Matthew Locke (“Delights of the Bottle”), and Henry Purcell (“If Love’s a Sweet Passion,” “Let the Soldiers Rejoice,” and many others). Purcell (1659-1695), considered by many to be Britain’s greatest composer, was organist and choir director at Westminster Abbey, but he also wrote popular operas, choral anthems, sonatas, consort music, and theatrical songs. The music coming from such composers was generally more complex than the relatively simple dance tunes, with sixteen, twenty-four, and thirty-two bar structures in some of the most popular songs, accommodating a range of stanza lengths and forms far beyond the typical “ballad stanza.” But for every ballad tune that originated on the stage, there was another tune that came from the street ballad tradition and was adapted for the stage. Towards the end of the seventeenth century, writers such as John Gay and Thomas D’Urfey developed a stage genre called the “ballad opera,” the most well-known of which is Gay’s Beggar’s Opera. These ballad operas featured popular tunes and even broadside texts adapted for a long-form theatrical presentation. While tunes were constantly being recycled and recontextualized, there were also new melodies always being introduced into London’s musical environment. There were a number of composers who, like Purcell, worked in many musical genres but who became best known for composing tunes specifically for the accompaniment of broadsides or other political or recreational songs. These influential, yet now obscure, composers created some of the most popular melodies of their day. They include Thomas Farmer (“Busy Fame,” “The Fair One Let Me In”), Christopher Fishburn (“Hark the Thundering Cannons Roar”), and William Turner (“My Life and My Death”). Although these tunes were all highly successful and used for dozens of broadside ballads, the lack of effective copyright laws to protect musical compositions meant that the tunes could be used by any ballad printer, and the composers would not receive any compensation. Meanwhile, yet more ballad tunes, like “Rogero” or “The Spanish Pavan,” had foreign origins. London audiences enjoyed the fresh sounds of melodies from Italy and Spain, which also moved quickly from stage to street and back again. 1 Philips Barry, “The Music of the Ballads,” in British Ballads from Maine, ed. Philips Barry, Fannie Hardy Eckstrom, and Mary Winslow Smyth (New Haven: Yale University Press, 1929), xxi-xxxvii. 2 A “bar” is a unit of musical time, which, in broadside ballads, usually consists of three, four or six beats. 3 William Byrd. Psalmes, Sonnets and songs of sadnes and pietie (London: Thomas East, 1588) p. 1. Barry, Philips. “The Music of the Ballads” in British Ballads from Maine. Ed. Philips Barry, Fannie Hardy Eckstrom, and Mary Winslow Smyth. New Haven: Yale University Press, 1929. Byrd, William. Psalmes, Sonets and songs of sadnes and pietie. London: Thomas East, 1588. Chappell, William. Popular Music of the Olden Time. London: Cramer, Beale, & Chappell, 1859. Dugaw, Dianne, ed. The Anglo-American Ballad: A Folklore Casebook. New York: Garland Publishing, Inc., 1995. D’Urfey, Thomas. Wit and Mirth, or Pills to Purge Melancholy. London: Henry Playford, 1698-1720. Playford, John. The [English] Dancing Master. London: Harper and Playford, 1651-1728. Watt, Tessa. Cheap Print and Popular Piety, 1550-1640. Cambridge: Cambridge University Press, 1991.